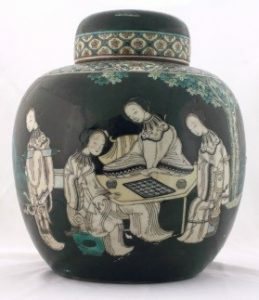 In China, there were four courtly pastimes; playing the zither, a plucked string instrument, playing the board game known as go, practising calligraphy & engaging in art appreciation. In Chinese these four pursuits are known as “qin qi shu hua” (zither, go, calligraphy, painting), all a part of the broader category of “wen”, the cultural arts of peace. These four arts were the main academic and cultural accomplishments required for the aristocratic ancient Chinese scholar. The four arts were a well-known theme not only for classical arts but also folk art throughout China’s history. 琴 Qin is a seven-stringed zither, the instrument has a history of at least three thousand years. Today, the word qin refers to all stringed instruments. 棋 Qi is the longest lasting and most popular board game within China. Qi, refers to the game known as go involving a gridded board with black and white stones. 书 Shu is the art of calligraphy, writing characters has a long tradition in China and East Asia and often is influenced as well as influencing the creation of art. 画 Hua is the art of painting in China, it is the last and most creative of the four arts. This more traditional form of painting is also known as ink and wash which is closely related to the art of calligraphy, both in its appearance and techniques. 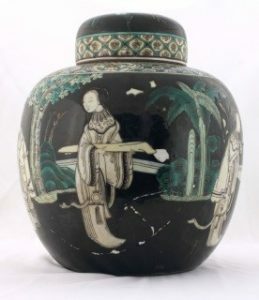 Famille Noir means “the black family”, a type of porcelain made in the 18th century reign of the Kangxi Emperor (1662-1722). The black colour of the porcelain was achieved by applying green lead based enamel over an unfired coat of Chinese cobalt. On firing the object, the two would combine to give an intense back with a hint of green. Many examples of Famille Noir porcelain are fakes made in the 20th century, and genuine pieces are relatively rare. This is part of series of blogs about our collections for Women’s History Month (March 2019).